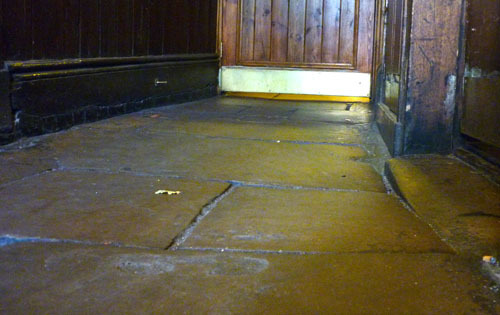 I’m in the hall of the Bell, crouching to the floor to photograph the flagstones. They’re an unusual feature, like a piece of the outdoors coming in. A bouncer asks what I’m up to – not in a threatening way; he’s just curious. I’m sort of curious too – as to why what seems like a cosy and sedate pub might need a bouncer on a Saturday afternoon. But then I’ve never been to the Bell before, and I have a lot to learn. That sounds ominous. It shouldn’t. It’s not a fight that’s about to open my eyes: it’s a lesson in the history of Nottingham. At this point I’ve been in a small-ish room at the front of the pub, gathered with a few friends before the popshow we’re seeing tonight, very close by at the Chameleon. We’ve come from Nottingham, Sheffield, London and the other hubs of the UK’s indiepop microscene. We’re together again here, as we have been at other times, in other cities, and we’ve scattered the rucksacks and sleeping bags that will sustain us on the friends’ sofas we sleep on tonight. Those in the bands have put down guitars. And now we start to talk, and smile, and love. This is what we do. We’ve also sunk a few pints of a delightful brew called Ginger Pig, the colour of June evening sunshine. Greene King has allowed the management of the Bell to add other beers to the company’s tedious roster of Abbot and Old Speckled Hen. Back in Sheffield, this has also worked a treat in reviving the fortunes of the Broadfield. More of that, please. If I’m interested in the history of pubs, says the bouncer, I should look in the other room. There’s an old well. In the pub? Yes. Alright, then. He conducts me towards the back of the pub, where another room opens out and comprehensively surprises with its vastness. It seems three or four times the size of the front one. It’s like a whole pub within a pub, or at least a Wetherspoons within a pub. So that’s the bouncer’s job explained. What about this well? He delivers me to a kind-faced middle-aged man at the bar and leaves him to do the history thing. There’s a strong impression that this is sort of his job – not what he gets paid for, but his role in the social machinery of the pub. I quickly learn that he could give the professional tourist guides a run for their money in teaching the Americans who come to this city to learn about Robin Hood (the socialist it’s OK for Americans to like). The well is not a working well with a crank and a bucket on a rope or anything. But it’s quite a thing to see. A dusty shaft descending into gloom of unfathomable depth, it dates back to the 13th century. It’s also illuminated so you can see down a fair way. 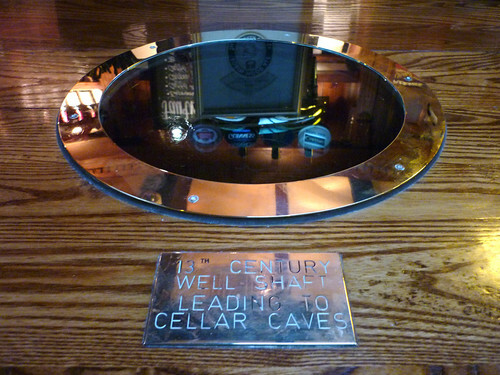 Remarkably, it’s capped with a glass lid and built into the side of the bar with a wooden frame and a plaque to tell you what it is. So this is a pub that goes back a fair bit – in terms of both history and its physical layout. My newly appointed tutor, Paul, embarks on a genuinely fascinating talk about the way Nottingham has changed and some of the city’s oldest pubs. The famous Olde Trip to Jerusalem, it seems, is far from the only one with a past it can be proud of; the Bell has been around since the 15th century. Paul also tells me about some old documents he found when he bought his house. These record the amounts donated by drinkers in each Nottingham pub to support the city’s children’s hospital before the founding of the NHS. “Give me your address and I’ll send you photocopies!” promises Paul. It’s the sort of superbly random pub talk that best happens when you’ve nowhere to go and plenty of time to get there. But my friends are starting to head out to the Chameleon, where top-notch pop music and more pints await. I say cheerio to Paul and join them, glad for this intangibly life-improving slice of experience. Historians are keen on telling us that history surrounds us every day. At the Bell it’s right there under our noses.